I don’t know what to say about this one, really. Its plagued me for over a week – I liked the book, I liked what it had to say about grief and memory… but I can’t quite put it together into a comprehensive opinion about the book. Here’s some thoughts I do have, though. 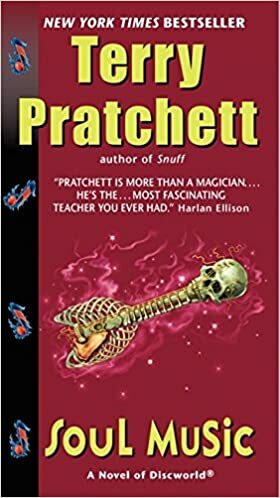 The book in typical Pratchett and DEATH fashion splits the narrative – we have a fab foursome causing wizards to shake, rattle and roll, and managing to bring some broken furniture and jam-packed concerts to the Mended Drum. Suddenly, there’s an earworm loose in Discworld, and now everyone’s got a song in their hearts. In addition to that, we have Death once again going off the grid and abandoning his responsibilities in a similar vein to Mort, leaving the repercussions to be dealt with by someone else. This is only the third Death book and yet it already feels repetitive. Part of the reason it frustrates me is because Death is a fun character, and I want to see more of him doing the job of Death. It was also a lot of waiting for emotionally honest moments like Reaper Man. But when they come his expresses misery at the fact that he is capable of preventing deaths but is forbidden to do so is poignant. This one fell flat for me. 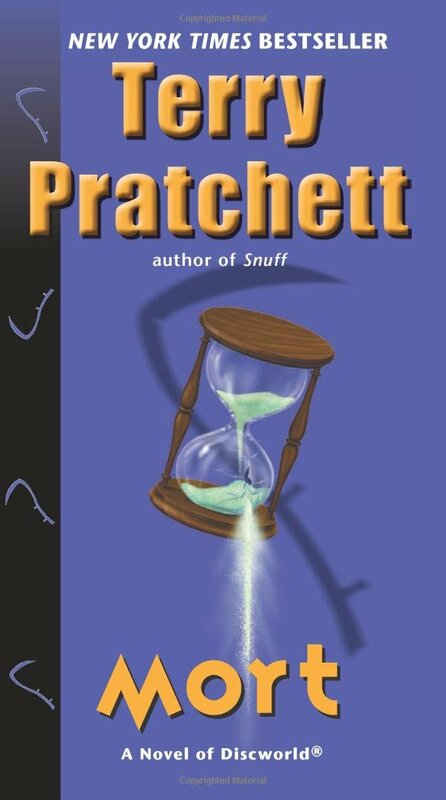 I think most of the music references were from the 50s and 60s, and since that’s the music my dad played all the time I think I caught most, but certainly not all, of Pratchett’s in-jokes, but they felt more tiresome than inspiring by page 200 of 424 (there was a time I was lamenting the relatively short length of Mort, and unfortunately this one being nearly twice as long doesn’t help). The constantly-repeated “he looks elvish” joke, Imp’s translated name… it’s all a bit much. It squeaks by with 3 stars because I love the Death of Rats, Quoth the Raven, Susan, the swing that Death built for her and pillows on bony knees, and her memories returning while Binky and Albert go about what needs doing. As is usually the case, it’s easier to identify my complaints than what worked. 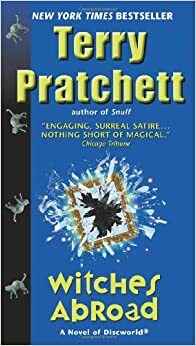 I enjoyed the humor as is usually the way with Pratchett books, he has a great way of using witty descriptions for common things. I also really enjoyed the character of Susan, as the granddaughter of the anthropomorphic personification of a concept. The things she “inherits” from him even before officially inheriting the work are another interesting sidetrip into what we pick up in all the other ways besides genetics. This book was read and reviewed as part of the charitable Cannonball Read, where we read what we want, review it how we see fit (within a few guidelines), and stick it to cancer one book at a time. 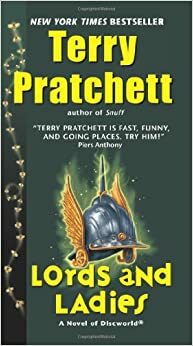 I had planned to read one Discworld novel each month in 2015 as part of my cannonball read before hearing about Sir Terry’s passing last month. Now that goal seems even more important. While I am still a newbie to his work, Lords and Ladies being only my fourth book of his, I was still struck by how quickly a truly gifted writer can bury themselves into your conscience and feel like your own. I may not have known you work long Sir Terry, but it knows me well. On to Lords and Ladies because Granny Weatherwax aten’t dead. Our favorite three witches have been away on their adventures from Witches Abroad, and lots of things can happen in eight months’ time. Magrat is planning to marry the new king (and former fool) of Lancre. Well, more accurately Verence is planning on marrying Magrat who is going along with the idea. Anyone who’s everyone will be attending the Royal Wedding, including the Librarian and Archchancellor from the Unseen University. But this is Discworld, and more specifically the Ramtops. There’s always something going ever so slightly off. The impending Midsummer’s Eve is no different, as we’ve reached circle time when the barriers between worlds are thin. Even the bees are worried. You see, the “lords and ladies” have somehow found a way through, and they’re NOT here for the Entertainment. 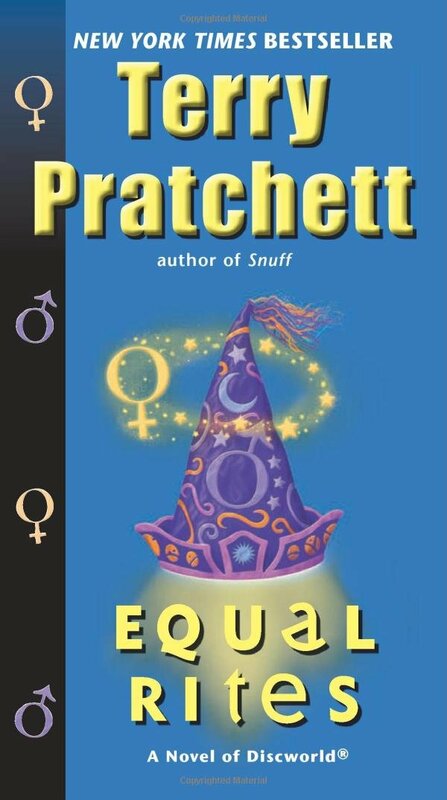 Now, it’s up to Granny Weatherwax and Nanny Ogg to stop Magrat’s fairy tale ending from being ruined by…fairies. This is perhaps the darkest book in the Witches series thus far. The previously unflappable Esme Weatherwax is off her game in this one as the circle time is messing with her mind a bit. We get an interesting look into Granny Weatherwax’s psyche – who she is, what she fears. It makes her more relatable. She was once a girl who made the tough choices and wanted something very specific from her life. Lords and Ladies also features a very big bad. Sure Witches Abroad had Granny’s sister up to no good, but for some reason the wanton violence of this book was more unsettling than I’ve previously experienced in Discworld. As usual Pratchett is playing with big ideas in his books interweaving them into the basic plots. This book also offers a good look into the human need for the imaginary, for make believe. Or put another way the glamour of Belief. A little less than halfway through the book Granny is dealing with the first incursion from the elves and is explaining to Verence what is happening (in her Granny-like way) and lays out that beauty, grace, style are all things that can cloud our judgement and our memories and in this way the elves are more dangerous than can be easily understood. No one remembers the danger, the ugliness. We only think back to the good, or glamourous. It is through this remembrance, through belief, that the elves anchor themselves to the Discworld – if enough people believe the elves will come, and then they will. But the longer they stay away, the more time we get without them, the more they become what we think they are: stories, myths, and old wives’ tales. 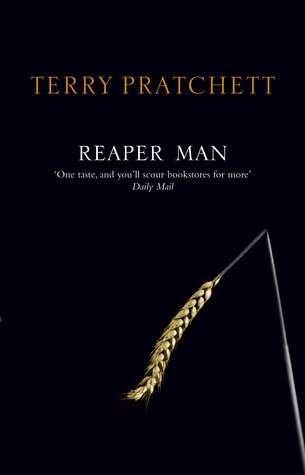 Pratchett lays out in this narrative our need for stories to get us through the tough time. But we don’t need the objects of the stories here, in the real world. Because in the real world (whether it be disc shaped or otherwise) we have only ourselves to count on, and we need to be strong enough to do that. Stories are good, in their place. But never mistake a story for the real thing.